What is the approved rescue signal for identification from the air? How far off the coast must a vessel be in order to dump bulky food waste? The entries to be made in the Vessel’s Log Book include the details of maintenance to machinery and equipment. a. Small waves becoming longer. Fairly frequent white horses. b. Small wavelets. Crests do not break. c. Large waves. Extensive white foam crests. Spray. d. Large wavelets. Crests begin to break, Scattered horses. 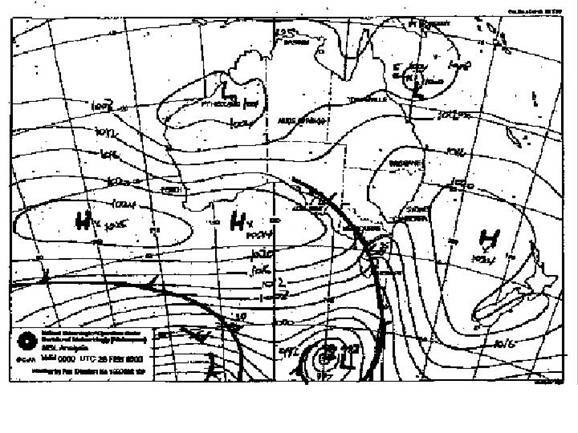 On the Weather map above describe the likely weather in advance of this front as it approaches Melbourne, with particular reference to the pressure, wind, temperature and precipitation. The best action to take on receipt of a cyclone warning is to batten down and head for the nearest safe haven . When anchoring in a safe haven to seek shelter from a cyclone, the master should check that there will be sufficient swinging room at all times. When watchkeeping in port, the watchkeeper should ensure that appropriate safety signs are in place in relation to the working of the vessel. The barometer reading drops suddenly and you notice the swell increase. The Master’s instructions include one to call him when in any doubt. Large vessels are not as manoeuvrable as smaller vessels because of their size, hull shape and power. d. head line on, go slow astern, and hard a’starboard. Why is a rock pick, or grapnel, most suitable for anchoring over a reef or coral head to fish? Shallow water effect may cause a vessel’s propeller to lose effectiveness. If a liferaft is being launched on the listed side of a vessel, it is vital to ensure that the vessel will not capsize on top of the raft. Regular care and maintenance inspections must include a check that portable fire extinguishers are free of damage or corroded . For the protection of personnel, a shore gangway or brow should be rigged with a safety gant line. Before a crew member enters a tank to carry out an inspection, it must be well ventilated. Onboard procedures must be in place, detailing how to deal with different emergencies, because it would be inappropriate to adopt similar procedures for all emergencies. An emergency response card dealing with disablement of the vessel, should include a recommendation to deploy a sea anchor . Rope less than 48mm can be uncoiled direct from the centre of the coil. The direction in which to coil a left hand lay rope is anticlockwise. Excessive heat will make natural fibre ropes hard and brittle. A steel wire rope should be discarded if the total number of broken wires visible in a length equal to ten times its diameter exceeds five per cent of the total number of wires constituting the rope. One end of a rope is fixed to a boat. The other end is free. What is the name of the section of the rope between the two ends? At no time must the SWL Load of a crane be exceeded. Which of the following items would be considered part of the anchor gear? To enable them to be secured for sea, side scuttles should be fitted with deadlights .